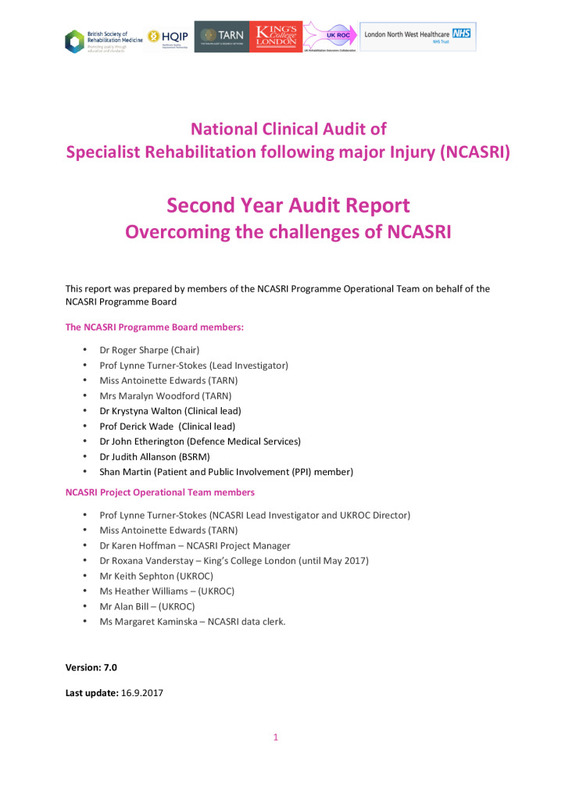 The National Clinical Audit for Specialist Rehabilitation following major Injury (NCASRI) was commissioned to determine the scope, provision, quality and efficiency of specialist rehabilitation services across England and improve the quality of care for adults with complex rehabilitation needs following major trauma. A key component of NCASRI is to link data from the Trauma Audit Research Network (TARN) and the UK Rehabilitation Outcomes Collaborative (UKROC) datasets through the NHS number, in order to track patients along their journey from the Major Trauma Centres to the specialist (Level 1 and 2) rehabilitation services and to examine the outcomes and cost efficiency of rehabilitation for patients with major trauma. NCASRI aimed to enroll all adult patients in England who require specialist inpatient rehabilitation to maximise their recovery from severe injury following acute treatment in a Major Trauma Centre. In the second NCASRI report, they describe some of these challenges, the steps that have been taken to overcome them and the lessons learned. They present some preliminary data from the MTC’s for the cohort of patients enrolled in the prospective audit to date. The full report and accompanying appendices are available to download from this page (see below links).